Golden Years is a senior companionship volunteer program that serves and interacts with the older adult population in Humboldt County. Through volunteering, whether it is home assistance or playing games, Golden Years’ priority is to create fun, loving, and strong relationships between the volunteers and the elders. By providing recreational activities and companionship with seniors, who may feel isolated from society, we are bridging the gap between younger and older generations. In western society, ageism is a prevalent problem; it is all too often we may find an elderly person shunned or neglected. Overlooking the older generations can leave older adults feeling isolated, lonely, and disconnected from society. According to the 2009-2010 report from Area 1 Agency on Aging, the elderly population In Humboldt County has more than doubled in the past three decades, from 11,303 in 1980 to 26,209 in 2010*. With more senior citizens than ever before, Golden Years services are in high demand. “The government has largely cut off the funds which seniors rely on to do recreational activities” (Marlene, supervisor at Golden Sunset senior care, Arcata, CA). With the decrease in funding Golden Years has seen an increase in demand from individual citizens. We are beginning to shift our focus from serving group care homes to serving more individuals, to accommodate the demand. Golden Years dedicates time contributing to the quality of life for Humboldt’s seniors and strives to bridge the gap between generations by spreading positive knowledge about senior citizens, shattering stereotypes about the elderly and working toward reducing prejudice. Every community has seniors that would appreciate free and friendly services and activities. By going out and volunteering, Golden Years fosters light-hearted experiences between two age groups which don’t commonly interact on a daily basis. We provide services such as gardening, cleaning, wood-stacking and laundry, as well as activities like bingo, cards and Scrabble. Most importantly Golden Years keeps our elderly population smiling with happy hearts. HSU students will benefit from volunteering with Golden Years in many respects. Having weekly workshops will ensure that they gain skills in working with senior citizens. Providing recreational activities and social interaction will give students an opportunity to give back to their community. After service, students will be able to gain a sense of accomplishment and will see how their efforts really do make a difference. Senior citizens are thankful for all that volunteers do! 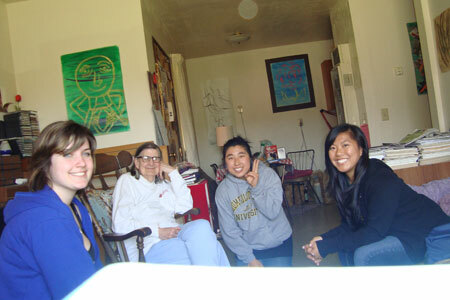 Overall the volunteers will create bonds with the elders and with the other volunteers. Every Friday afternoon volunteers either go to Silvercrest Residence. Silvercrest is a subsidized independent living facility and all senior citizens are mobile and in relatively good health. At Silvercrest volunteers usually play games with the seniors, such as: Karaoke, puzzles, Skipbo, etc. Sometimes volunteers also help tidy up or clean apartments and walk dogs. Most elders enjoy talking with the volunteers during the service. 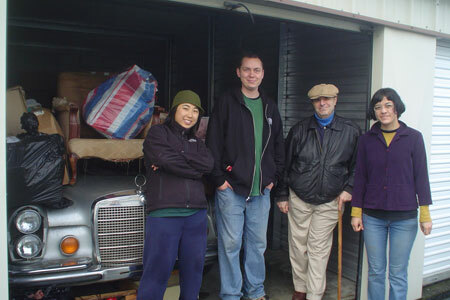 Volunteers help to move storage contents for a resident's elderly mother.